As always, we’re excited to share details of how the support from our generous donors has been used and what it has accomplished. We are particularly proud of our three Zimbabwean scholars, each of them supported by Cecil Campaign funding. It was a great pleasure to see them together in Oxford recently and we took the opportunity to take a team photograph at WildCRU’s Recanati-Kaplan Centre. Each has a wonderful story, and is at a different stage in their unfolding careers. 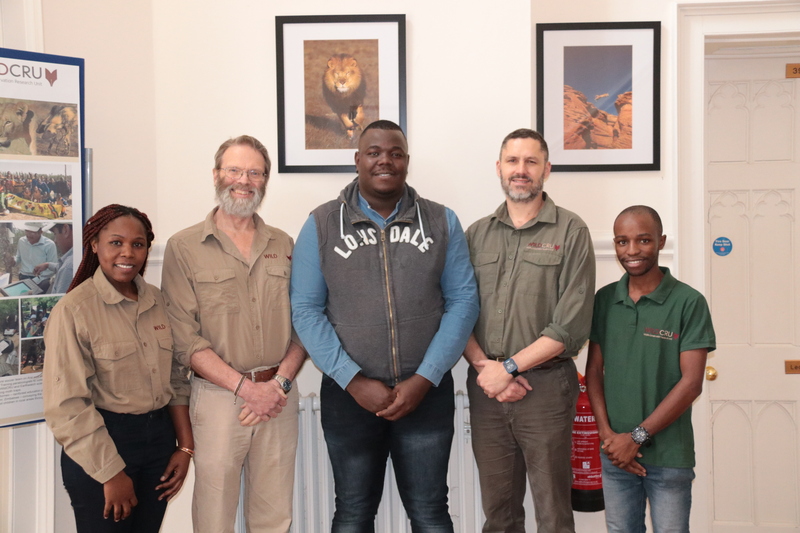 Moreangels Mbizah has just submitted her doctoral thesis on the behaviour and ecology of lions in Hwange National Park (she worked on Cecil’s pride) – she’ll be examined on her thesis next month, and we fully expect an important career lies ahead of her in Zimbabwean conservation. Lovemore Sibanda has just passed his ‘upgrade’ from Masters student to doctoral student, and he is studying the attitudes and well-being of the poor farming communities around Hwange – the people who own the cattle all too often killed by lions. Finally, there is Liomba-Junior Mathe, who is heading the field team looking at ways of reducing lion attacks on cattle and increasing food security for the local people. The careers of all three of these remarkable people have been possible because of Cecil Campaign funding.